2 bedroom, 2 bath cabin, comfortably furnished with a second floor master suite with King Bed, tiled walk in shower with jacuzzi bath tub and a private outdoor balcony. The second bedroom has a Queen Bed with access to the main level deck. In addition to the two bedrooms there are double & single air mattress. The cabin can sleeps six comfortably. There are HDTVs in both bedroom as well as the living room with internet service. Cabin is tucked away with easy access and plenty of parking. 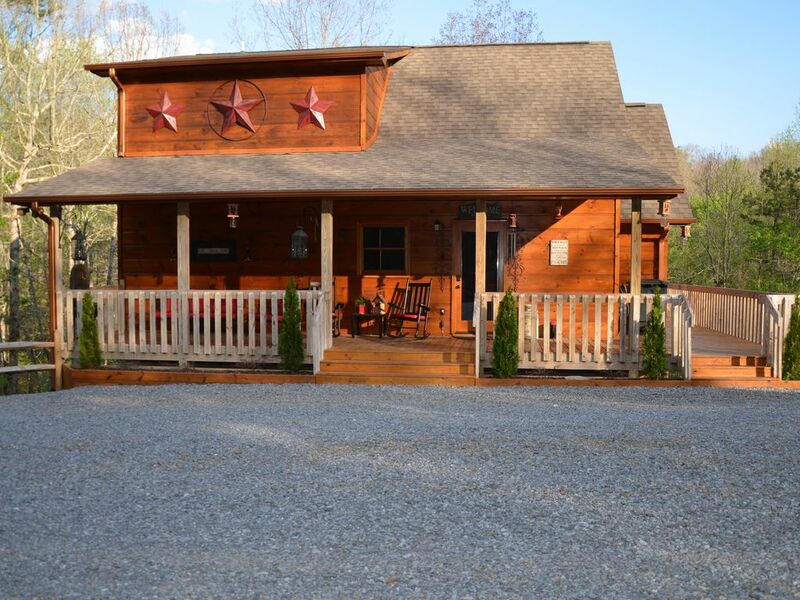 Little Creek Cabin is conveinently located only 3.5 miles from downtown Blue Ridge. Come enjoy a train ride, dining, shopping, horseback riding, hiking and biking, fishing, whitewater rafting, canoeing, or a lazy day tubing down the Toccoa River. After a busy day enjoying the many activities available, spend a quiet evening relaxing on the front porch taking in the sounds of flowing water from the fountain or enjoy a fresh beverage and good read while relaxing on the large furnished rear deck. Take a walk down to the creek located at the rear of the property and enjoy the sounds of the bubbling creek. We look forward to your visit and would love the opportunity to serve you. We decided to take the kids to the mountains for a couple of days during Spring Break. We usually take trips to Blue Ridge in the Fall but so glad we chose this time of year as it was less crowded and the weather was perfect (cool/mild, sunny days and cold/chilly nights). The cabin was perfect (so clean, offered everything we needed, and the property was a nature lovers dream complete with little creek of course). We also loved how close it was to downtown Blue Ridge even when you felt so tucked away from everything when at the cabin. Cell service was spotty at cabin at times, as to be expected though in the mountains. Wifi worked great! Owners were very kind and felt accessible. We really enjoyed our stay at Little Creek Cabin and will look into renting here again next time we head to Blue Ridge! My family (husband and 2 kids, ages 3 and 6) recently stayed in Little Creek Cabin for Spring break and it was amazing. The owner's were very attentive and they helped me in answering questions about Blue Ridge itself. The property is just as described and pictured and we had no problems finding it with the directions provided. We wanted a cabin, but not one so far out of town or so high up in the mountains since we were traveling with our kids for the first time to a cabin. This place was perfectly situated just a few miles out of town, but with the open forest in the back you had the feeling of being very secluded. We even had the pleasure of seeing a group of about 10 deer running through the back one afternoon. My husband is very picky when it comes to cleanliness and he was impressed with how clean Little Creek Cabin was. It was well equipped in the kitchen and bathrooms as well. The appliances are all in great shape, look pretty new and it was so nice having a washer and dryer there since we had been on the road for a week by the time we got there. Coming from Miami, we do not have a fire place so it was nice that with the push of a button we were able to turn the fireplace on inside. My 6 year old loved that it had a Wii and a ton of games. It also had some board/card games and movies for all ages. The back patio of the main level was perfect for a little peace and quiet and we loved exploring in the back yard and the little creek that ran through the property was calm and serene to listen to. Blue Ridge itself was also a dream. Everyone we ran into was so friendly and we loved getting outdoors and exploring. This was our first family vacation that was not a beach, cruise or Disney and my 6 year old said that this was his favorite vacation so far. We only wish we could have stayed here longer. Next time we will for sure! For the price you cannot beat this cabin, the cleanliness and the level of attention you get from the owners, not a property management company. I scoured through hundreds of cabins for days before booking this one and I am so glad I trusted the reviews on Little Creek Cabin! Thank you so much for opening your home to us. The cabin was great, very comfortable and decorated nicely. We enjoyed the back porch and outdoor fireplace. It’s very convenient to Blue Ridge and surrounding towns. The owners were very nice and checked with us to make sure everything was satisfactory. We would definitely like to come back! We just had the most wonderful time. The cabin was in a great location and fully equipped with anything you can need. The pictures don’t do it justice this place is so charming. We would definitely come back. Highly recommend and we have stayed in cabins before this one tops our chart. The cabin was so very comfortable and relaxing. We had a great time and would recommend it to anyone. Close to town and other attractions in the mountains of Georgia. Thank you so much for taking the time and writing your review on Little Creek Cabin. We strive to make our guests feel welcome and like at home! We hope you have another opportunity to visit again! We loved our stay. The cabin was very clean and cozy. All amenities were great. The property was easy to find and close to town. We are so glad you chose Little Creek Cabin for your lodging! Thank you so much for taking the time and writing a nice review, we really appreciate it! We hope to have you stay again!